Create your own Craft Room in a Jar and discover why Mason jar crafts are so popular. This is a quick and easy project that you can make for yourself or give to your craftiest friend. This is a great gift idea and will surely make an impression on someone you love. Be sure to fill your creation with your favorite craft supplies such as paper clips, glue dots and buttons. Best of all, this genius craft is perfect for frugal DIY lovers. Mason jar craft ideas allow you to save up old glass jars you might otherwise discard and reuse them for something amazing. Even if you don't have room for a real craft room, you can build your own in a tiny jar. Find this project, and many more, in our free eBook, 20 Crafts with Mason Jars: Wedding Ideas, Centerpieces, Decor, and More. You'll love the great Mason jar craft ideas and won't believe how many great ideas there are for free DIY projects. If you love eco-friendly projects, then you'll go crazy for this collection of quick and easy crafts. Make sure jars are clean and labels removed. Cut pink scrapbook paper with scalloped scissors into a size that will fit the front of your jars. With pen, write desired wording onto labels. Peel off labels and adhere them to pink paper so scalloped edges show. 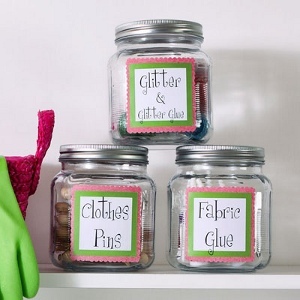 Use Aleene’s® Tacky Glue® to adhere entire labels to jars. Mason jars are an awesome tool for helping you stay organized. Discover fun and easy storage craft ideas with this collection of 8 Mason Jar Ideas to Keep You Organized and find out how easy it is to clean up your desk. Collect your loose hair accessories, art supplies and coins and store them in one of these decorate jars. Do you hate to throw anything away including jars? Why not use them to store things from your sewing or craft room to keep it organized. All you need to do is wash them out and make a label to put on jar. That is it. You can use your cricut to make your label fancy or even scrapbook paper and layer.Easy and useful project. Mason jars are the best thing that happened to my craft ideas hobby. I use them for holding my brushes and crotchet hooks. I used chalk paint to coat a section of the jar and label them if I don't intend on cleaning them with water often but I do agree that if you use them in your kitchen maybe to pickle then keep the label outside and then this craft is perfect. Mason jars really are wonderful. They are sturdy and reliable. I use them to store all sorts of arts and crafts supplies and also my button collection. I also use them to mix oil paints and acrylic paints and to store and carry turpentine and other solvents. They are great for holding water to dip brushes when painting with water colors. It took me about 20 years to come to this conclusion and method - whether I am using a plastic container or a glass container, I put my labels INSIDE the container rather than sticking them to the front. You still see them, they stay clean and fresh looking and that container can be reused without having to remove tape or glue residue at a later date. I use mason jars to put different colored buttons in each one, and I put Flower Soft colors in the smallest size mason jars. It all looks really nice in my craft room. Very colorful. They are also pretty inexpensive by the case. 12 per case....perfect storage. I use jars that popcorn comes in to hold a skien if yarn I am using to keepit clean These are the large jars. You can buy jars but these saves on the trash and can be used over again. I am the eldest of 10 living kids soI have learned to to save when possible. I knit and crochet a lot. You can print them there are thousands of free fonts out there too! And some awesome wing ding fonts (those are picture fonts) for crafters! What a fun way to get organized! I will add this to my list of craft projects. I use tackle boxes for my crafts! You can find them at WalMart for a very reasonable price. I think they're made by Plano. and you can put two of them together (slide mechanism) so that you are always organized. The jars are okay, but I can carry two (or four) of these tackle boxes, and have enough crafts to keep the grandkids busy for an entire week of camping! I have one for jewelry, one for oils (painting), one for acrylics, one for face-painting (complete with glitter/colored hairspray and nail polish), etc. I use a tackle box for my jewelry crafting! I love the huge ones because of all the little component compartments.